The MacAdmins 2016 Call for Proposals is now open! We’re looking for engaging, well-crafted sessions and workshops that showcase the latest tools and strategies for managing Macs and iOS devices. From technical deep dives, case studies, and soft skills, to workflow improvements, tool overviews, and essential admin skills – we want to showcase your knowledge and experience at one of the premier Mac and iOS conferences in the world. 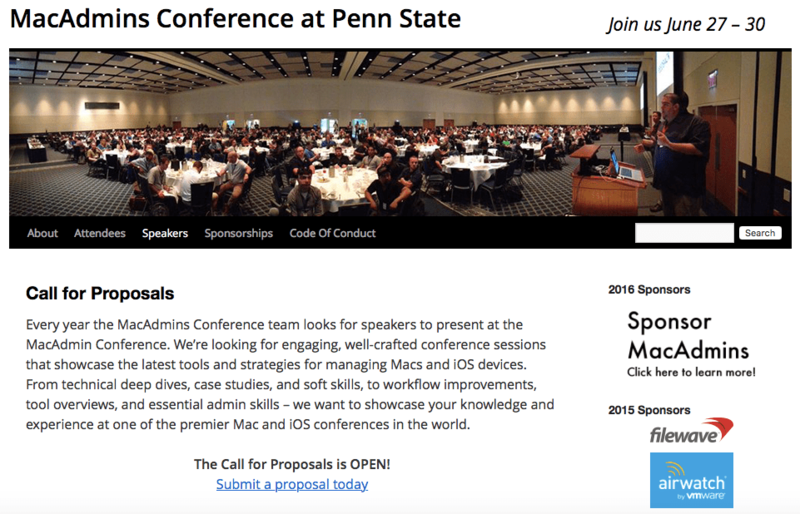 If you’d like to present a workshop or conference session, please visit our site below and fill out a proposal: < http://macadmins.psu.edu/conference/submit-proposals/ > Call for Sponsors Interested in sponsoring the MacAdmins Conference in 2016? Want to get your products and services in the hands of influential Mac and iOS administrators from across the world? See our information below and become a sponsor! < http://macadmins.psu.edu/conference/sponsorships/ > Save the Date Penn State MacAdmins Conference 2016 will be held June 27-30. Early Bird Registration Details on registration will be released in February! Stay tuned! Again, I think it’s time for a whole new generation of speakers, and please feel free to reach out if you’d like to be amongst them and would like a little help getting there! There are a lot of really good speakers at the conference. There are also a lot of really good engineers. Some are even both, although I tend to be neither. As I’m not doing a lot of public speaking any more, this will be one of the last 3 talks that I have booked. I’ll also be doing MacTech Minneapolis and MacSysAdmin out in Gothenburg, Sweden and then likely taking a break from doing any more talks for awhile. Ever get nervous in front of a crowd? I had an interesting recommendation for this kind of thing today: curl your toes. It’s funny, it helps keep you from gesticulating madly, mubling, etc. Shout out for that one!